September 20, 2017. Vieques, Puerto Rico. Hurricane Maria is barreling westward. Some residents have left the little island, though most by accident - a previously planned vacation, to buy supplies on the mainland. The rest remain, not knowing the extent of the wrath Maria will deliver, just that the result will not be good. Yet they plant their feet, lean shoulder first into the prevailing winds, pray for fellow Viequenses, ready for a long night that is going to last many months. I work in a company of good people. For that, I am grateful. 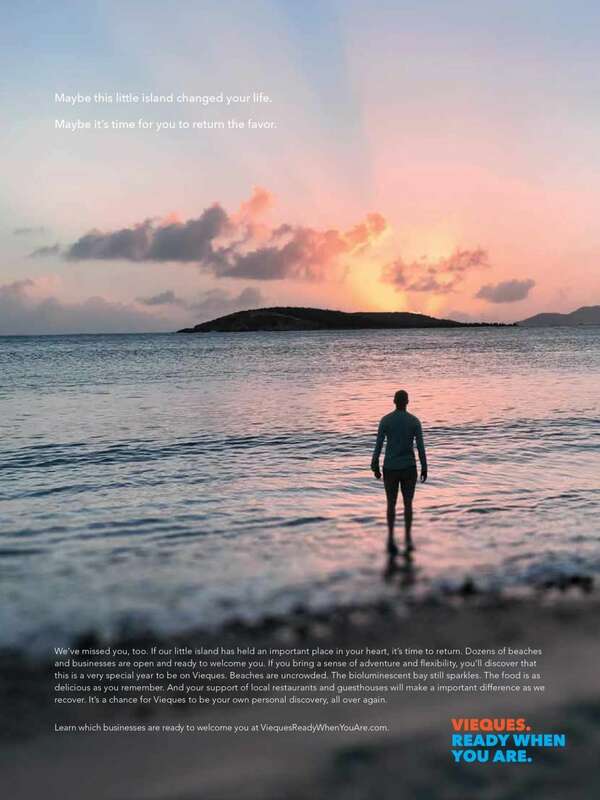 Eleven months after Hurricane Maria raked the land and ruined the homes and business of many on the small island of Vieques, Lewis Communications put its best foot forward, sending a team - Spencer Till, Stephen Curry, Carlton Wood, John Pope, Claire Flowers, Emily Nicholson and myself- to the island to help them say, “We’re back. Come visit.” Quarterbacked by Stephen, our executive creative director and a long-time visitor to the island, we left the mainland on a muggy Thursday morning in hopes of some sun, a little fun, and the chance to give back. We checked each aspect off the list multiple times per day. 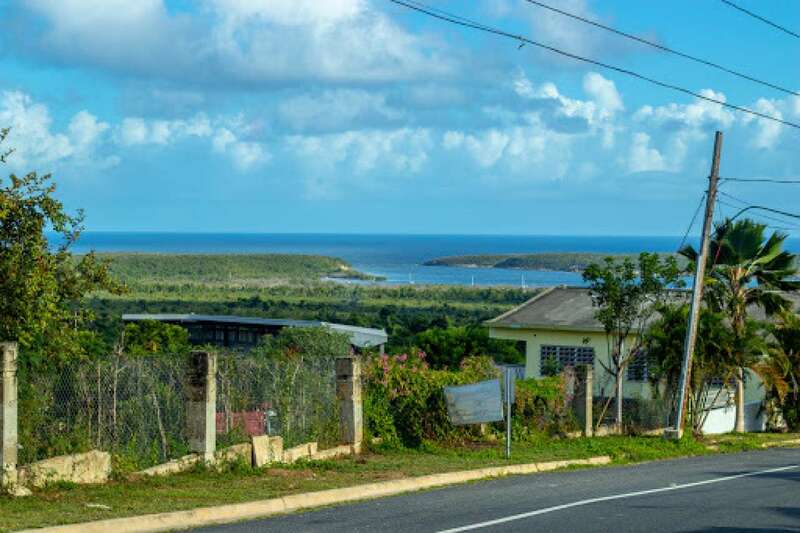 Vieques is 21 miles long and four miles wide. For such a small place, life is happening all over the island. We stayed in the town of Esperanza, home of El Blok, our hotel, and the Malecón, the town’s main thoroughfare, if you will. Just up the road is the busier Isabel Segunda (also called Isabel II). This is where you will find the thickest cluster of hotels, bars and restaurants. Everywhere we drove, walked and filmed during our five day stay would reveal an assortment of places to sleep and/or eat; like hideouts from the rest of the world. The island itself is virtually a hidden oasis, always offering a sensation like we were somewhere much further from home, the edge of the earth perhaps. It wasn’t just the landscape or the people or the culture, but all three, that drove the feel of the island into the very bedrock of my soul. Despite hours of footage we’d capture over the next several days, I’d hardly call it work. It was more of an eye opener to a dot on the map where I felt both out of place and right at home. And I can certainly see myself returning, time and again, for many years to come. El Blok is a rotund, cement structure. Its outside built solid as the beast, the comfortable interior is refined as the beauty. Laine (lay-n-ee) Gorman, the hotel’s general manager, greeted us with a smile and a round of Sahumerios - a rum drink where the glass is first turned upside down and filled with smoke from a burning sprig of rosemary. A cube of iced coconut water with a cinnamon stick is dropped in the glass and covered with Ron Barrilito rum. It’s an elixir guaranteed to perk up the weariest traveler even though the early Uber, three airplanes, one publico and a rental Jeep ride later, the seven from Lewis Communications felt fantastic standing in the hotel’s lobby chatting with Laine and her staff. The combined 500 pounds of gear we’d hauled and shipped sat piled around our legs and leaning against the wall. While it may sound like an orchestra of planes, trains and automobiles to get to Vieques, it was really quite easy. I flew Southwest out of Nashville to Fort Lauderdale then on to San Juan. The rest of the team, from the Birmingham office, flew Delta to Atlanta then straight to San Juan. You could easily get another flight from SJU to Vieques, which takes about 30 minutes, but we chose to charter a van to the town of Ceiba to take in the landscape. From Ceiba, it’s a seven-minute plane ride to Vieques and you’re “on island.” On the way back, however, we did elect the half hour flight straight to San Juan. For me, the island’s geography and where I’d spend the next few days arrived in tiers: from above, in the plane, the blue water of the Bahamas; a hilltop curve, driving in our rented Jeep, on Highway 201 spilling its view toward the Atlantic; arriving on the rooftop of El Blok and the full scope of our surroundings, up there the sunset illuminating Vieques’ allure and destruction in a light so soft that beauty prevailed from both. A sign nailed to a tree across the street from El Blok states, “We are stronger than Maria.” Without a doubt. Driving in our Jeep down Highway 201 to Esperanza, this hilltop view become one of several instances that drew me closer to the island’s grasp. Maybe my same thoughts circulated among the rest of the crew. Stephen has been traveling to Vieques since the winter of 2000. Looking for temporary reprieve from the Boston cold, he first found San Juan. But what was supposed to be a day trip to Vieques turned into a week-long sabbatical on the tiny island. 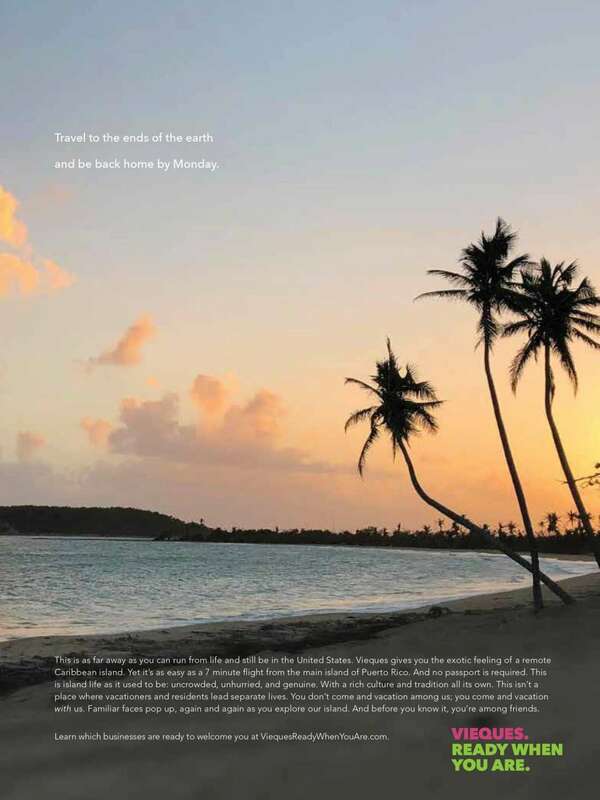 “I got to Vieques and right away fell in love with the place,” Stephen said. 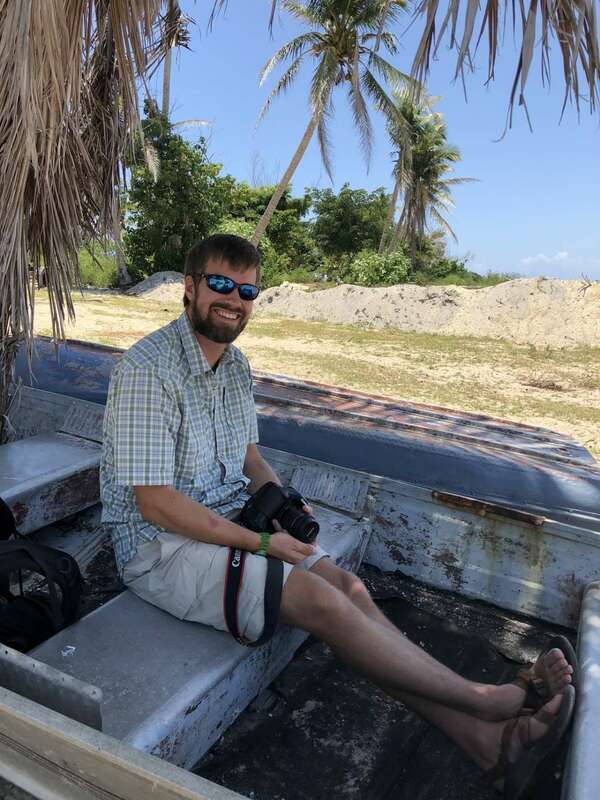 “So I left my rental car sitting at the ferry on the main island and spent a week here.” Nearly two decades later with several trips a year under his belt has made Vieques a home away from home for Stephen. It wasn’t hard to see why. Just outside El Blok sits a row of shops and restaurants on a string-light-lit street called the Malecón. 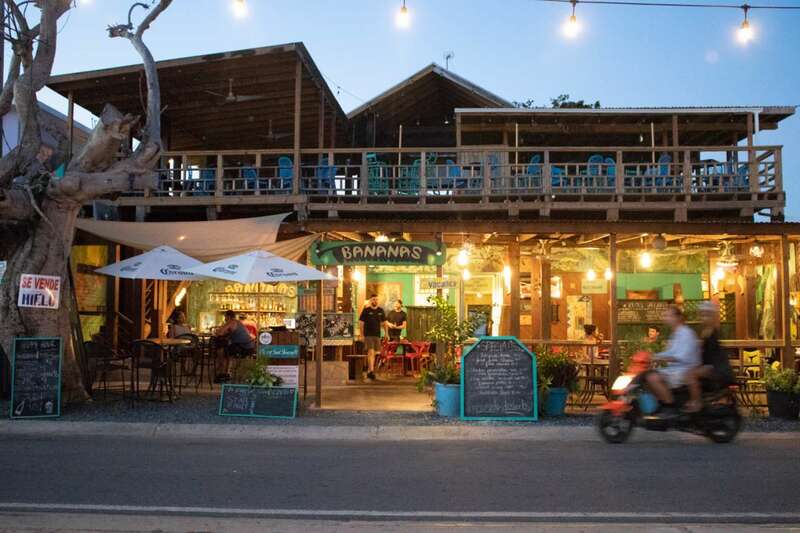 It’s the place to find good food (both from street vendors and popular establishments), cold drinks in no-frills bars, people watch or just take a quiet stroll. Waves crash against the rocks and a seawall left broken by the storm. There are holes in the sidewalk where surges uprooted concrete that hasn’t been repaired. Under the lights of the Malecón, these things are so minor compared to young men and women zipping by on horses, Mambo dancers undulating to the beat of drums and bongos, the smell of Puerto Rican food or the heft of a cold bottle of beer in your hand. Toothy grins and nods from locals make you feel as if you’re part of Vieques even if it’s your first visit. 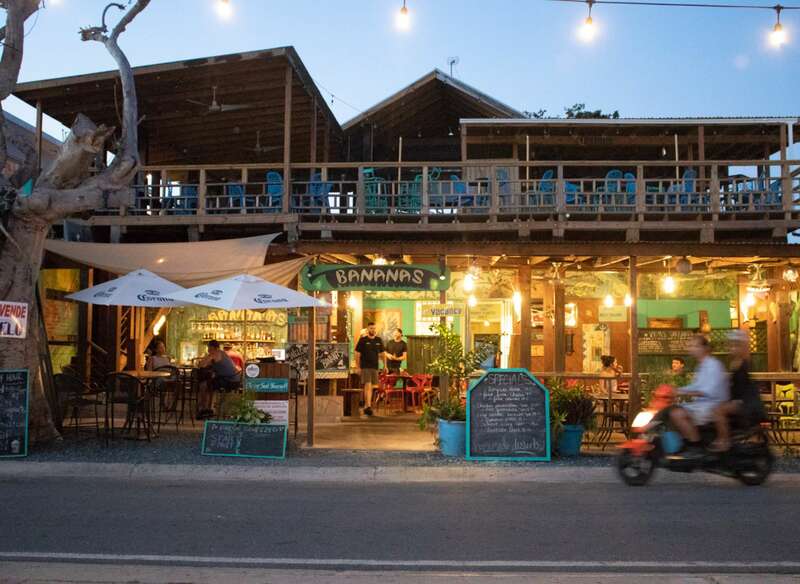 Bananas bar is authentically Caribbean with open-air seating that faces the ocean. You mustn’t miss the opportunity to eat at Bili, the restaurant of legendary chef Eva Bolivar. She was part of a group of chefs and volunteers that prepared and delivered 3.7 million meals after the hurricane. The whole fried red snapper with beans and rice is incredible. Just go easy on the housemade hot sauce. Drink cold Medallas (the local beer), rum or whatever your flavor at the neighboring bars Duffy’s and Bananas. By the time you get to the island, friendly reader, I’ve heard “it’s my favorite restaurant in the world” when speaking of Kate and Scott Cole’s restaurant El Quenepo. I can’t attest to this statement, as they were still in the rebuilding phase during our brief time, but will reopen in November. 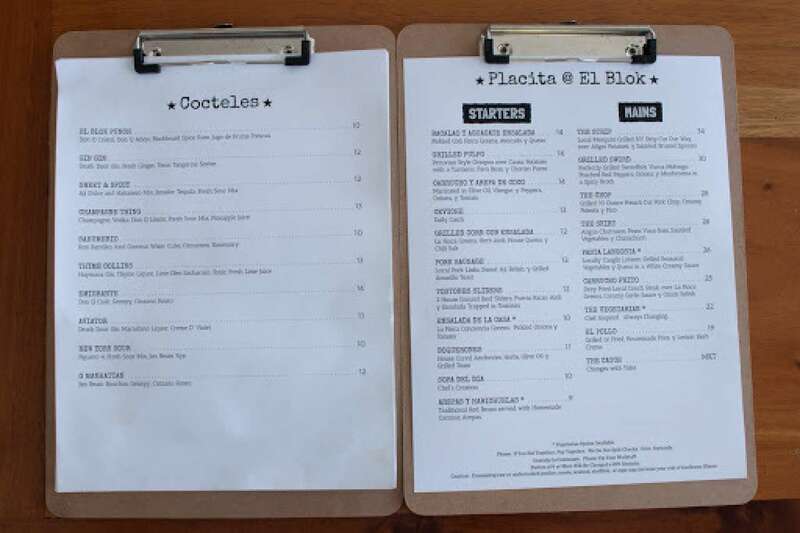 The drink and dinner menu at El Blok. Without a doubt the best meal I had on the island was a dinner at El Blok. We ordered a range of appetizers for the seven of us, including Grilled Pulpo, a Peruvian style octopus over causa potatoes with a tumeric, fava bean and chorizo puree; Ceviche, made with an assortment of fish caught that morning; Tostones Sliders, ground beef sliders, Puerto Rican aioli and salad between tostones; and three orders of the special, a delicious lamb stew. The main courses were too numerous for me to remember though my own, The Skirt (steak), angus churrasco, pesto Yuca fries, sauteed vegetables and chimichurri, was something I could eat four times a week. The chef uses a type of mesquite to fuel the wood-fired grill and the flavor it produces exceeds the mellow aroma you smell every time you walk into El Blok. You just have to go to find out exactly what I’m talking about; discover the things that don’t exist in words. 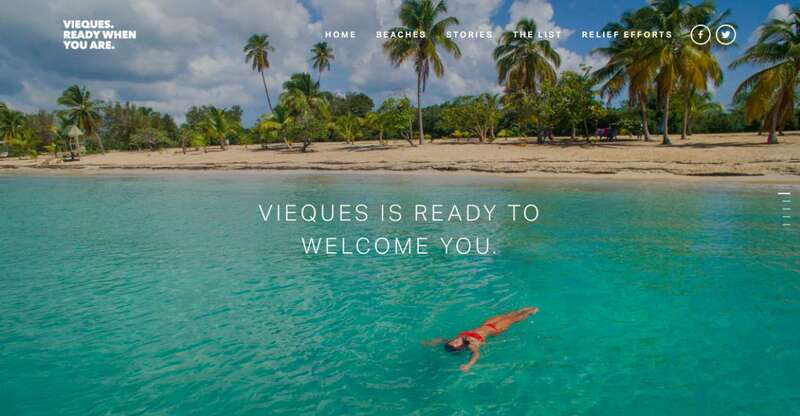 Once you’ve booked a flight and hotel, let the Internet help pick a few eateries, but use the locals’ knowledge to figure out what is Vieques. Short of leading you by the hand, they’re always willing to answer questions. Because Vieques is ready when you are. The campaign from this trip will be a multi-faceted approach to promote the island’s resilience and readiness for visitors. Below are just a few examples of advertising that the team has created. Check out more work at www.viequesreadywhenyouare.com.